My review of the Scan Gauge II that I purchased for iPd. ScanGauge II was worth the $$$. I'm a little bit of a number geek and like to know what is going on with certain things all the time. So I decided to purchase one of the Scan Gauge II code scanner, etc., from iPd. Yes you can get them from other places, I just like to do business with companies that support us Volvo owners. So I purchased one in July 2009. My primary reason was to have a trip computer in my '97 960. I was so busy traveling, working, etc., that the thing sat in the box for about 6 weeks. Eeeekkkk! So much for the 30 day money back warranty. Anyway, I finally opened the box and hooked it up to my 960. My main goal was to check my fuel consumption. I'd like to know what kind of gas milage I'm getting, especially at $3.75 per gallon for 93 octane . Pluged it in and it fired right up. It took about 20 seconds to sync with my ECU but I was ready to start playing then. The 1st thing I did was check my CEL. Ah, P0330, misfire #3, it reset the code in seconds. I didn't bother reading the instructions and within 5 minutes I had the thing set up to my cars specs. I set the engine size, tank size, then user colors. That was about it. There are probably 30 different color setting you can set, I set mine to match my outside temp gauge in my dash. Off I went. Now to start checking my fuel consumption. The ScanGauge has a home page that has 4 options, basically the screen from which you choose your direction. SCAN, TRIP, GAUGE, MORE. I chose GAUGE. 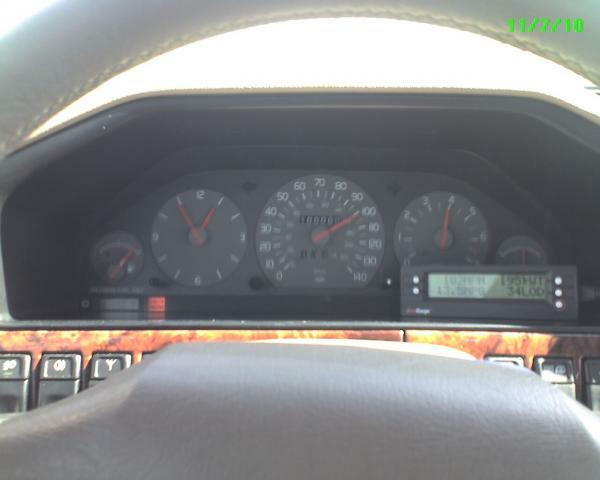 GAUGE: On the guage screen there are four displays, one in each corner. From that screen you can program the item you want to monitor in each corner. It was simple to set up, just push the button in that corner and the screen quickly displays what reading you want displayed. I soon found myself monitoring the following: MPH - TEMP - MPG - LOAD. Not sure why I choose MPH when I have that long needle right in front of me, but a year and a half later, it's still there. TEMP: The TEMP reading shows degrees of the coolant temp. When I start the car is show how cold the motor is, usually outside temp 1st thing, then it quickly starts to raise. By watching the TEMP I can see when my thermostat starts to close and I'm at full operating temperature. I never push my car before that temp is reached. MPG: The MPG setting show real time miles per gallon. What I'm getting at the time. Wether I'm driving up a hill, coasting down a street, or have it floored trying to pass another vehicle. Good information if you want to save on gas. LOAD: This setting basically shows the load that the motor is under, which of couse effects the mpg. So I watch that. A real nice thing about it is there is 12 standard meters built into the guage that you can set in any position of the gauge display. Simply keep pushing the button in it's corner until you have the meter you desire to be there. Now, back to the home page. From there I often choose trip. Once at the trip section of the gauge, you can view 4 trip computers, each computer has about 12 screens. The main 4 trip computers are: CURRENT, TODAY, YESTERDAY, TANK. While at the current selection you can view 11 different screens about your current trip. I usually have it set to average MPG so I can see what I'm currently getting on the current trip. From that screen you can scroll through the meters or through the other trip computers. So while looking at todays MAX SPEED, you can easily check what the MAX SPEED was for yesterday, the tank, or today. Very nice. I caught my neighbor on freeway one day when I had it set in my T-5R and I gave him a run from a rolling 40 mph. He drives a Mercury Marauder. Well after all was said and done, I was able to check my MAX SPEED for the day and seen what it was. FUN, FUN, FUN! OTHER OPTIONS: I was told while taking to Scan Gauge on the phone, that the Scan Gauge II can be set/programmed to display other meters than that 12 preset. The instructions are on their website and some in their instruction booklet. I'm going to program it to show actual horse power and display that on the gauge page instead of the mph. This gauge also can be programmed to send information to the ECU. I'm willing to bet that it can be set to clear service lights in models that need a computer to reset them like the S70's, etc. If I figure that out I'll be sure to post back. GLITCH: Urrrrrrrrrrgggggggggggg! I do have one problem. When connected to my 960, the MPG meter doesn't work right. When you first hook up the gauge you are suppose to do a master reset. Then you go to the gas station and fill up. Then you drive around until you have less than 1/4 tank, drive to the same gas station, during the same time of day as before, then fill the tank up. Once you fill the tank back up you go to the fill up section and compare how many gallons you added vs what the computer think you added. If the number is off, you are suppose to use the arrows to calibrate the actual gallons added and record the FACTOR %. Once you do that you press done and the computer is suppose to know your miles/gallons to empty from then on. Well, that works great on my '95 850 T-5R, but not on my '97 960. After I do that, every time, it looses the ability to know my MPG. It will range from 256 MPG and go as high as 1250 MPG. I WISH!!! Scan Gauge has not been able to help me figure the problem out so I'm going to try different things to work it out. I think I'm going to NOT calibrate it after the next RESET and see what it figures out on it's own after 3 or 4 tanks of gas. I have tried the manual method about 5 or 6 times over the past 12 months, it's just not working right with the 960. Over all I still give this tool a five star rating. I was able to figure out how to increase my MPG on the freeway from 23 MPG to 27 MPG. That alone saves me $35 every time I go and visit family (every 2,000 miles of highway driving) I drive about 30,000 per year so that adds up quick. On my 850 I have been able to get my MPG from 22 MPG up to 25 mpg. Any way you look at it, I'm saving about $525 in gas per year since I started using it. Really can't beat that, it almost covers my insurance cost. OTHER USES: Since I drive around with the thing in my car, I am able to help others that I see on the side of the road. I have helped several people get their codes and let them know what was wrong with their cars while they were broke down. I also used it to drive a car home that had a broken water pump. I hooked up the gauge, set the temp on the screen, and used driving methods to keep the temp in a safe range without overheating the car, VERY COOL. OVER ALL: If you don't have a scan tool, get the scan gauge. It's well worth the price and will pay for itself in no time. UPDATE with the MPG problem with the 960. I took a trip out of town and decided to give this another whirl. Well, when set up, it seemed to work good. However when I refueled the 1st time, and calibrated the gallons amount, it started acting up again. It was showing that I was getting 657 MPG (I wish). Well, I let that slide, and when I filled up again I just went to the refueling screen and selected DONE as directed in the instructions and for the first 100 miles it continued to act crazy, but the next day it seemed to be more accurate. Then I filled the tank up for the ride back home and went to the refuel screen, pressed the DONE button again and from that point on it seems to be working properly. My miles to empty works great and the MPG seems to be right on. However, when I refueled it indicated that I added 19.4 gallons when I actually added 17.7 gallons. No big deal, it still functions right. Now I noticed another problem with it, while connected to my 960. I have a CEL. I pulled the code, took 3 tries and it come up with a P0410. I reset the code and it came back 30 minutes later. Now when I try to pull the code it shows NO CODES FOUND - NOT READY. So it's now having problems pulling the code on the 960. I'm going to try my other code reader to check and clear the code. I guess I'll also try to track down the problem with P0410. how about 35 mpg ? My review of the Scan Guage II that I purchased for iPd. ScanGuage II was worth the $$$. I'm a little bit of a number geek and like to know what is going on with certain things all the time. So I decided to purchase one of the Scan Guage II code scanner, etc., from iPd. Yes you can get them from other places, I just like to do business with companies that support us Volvo owners. So I purchased one in July 2009. My primary reason was to have a trip computer in my '97 960. I was so busy traveling, working, etc., that the thing sat in the box for about 6 weeks. Eeeekkkk! So much for the 30 day money back warranty. Anyway, I finally opened the box and hooked it up to my 960. My main goal was to check my fuel consumption. I'd like to know what kind of gas milage I'm getting, especially at $3.75 per gallon for 93 octane . Pluged it in and it fired right up. It took about 20 seconds to sync with my ECU but I was ready to start playing then. The 1st thing I did was check my CEL. Ah, P0330, misfire #3, it reset the code in seconds. Off I went. I didn't bother reading the instructions and within 5 minutes I had the thing set up to my cars specs. I set the engine size, tank size, then user colors. That was about it. There are probably 30 different color setting you can set, I set mine to match my outside temp guage in my dash. Off I went. Now to start checking my fuel consumption. The has a home page that has 4 options, basically the screen from which you choose your direction. SCAN, TRIP, GUAGE, MORE. I chose GUAGE. GUAGE: On the guage screen there are four displays, one in each corner. From that screen you can program the item you want to monitor in each corner. It was simple to set up, just push the button in that corner and the screen quickly displays what reading you want displayed. A real nice thing about it is there is 12 standard meters built into the guage that you can set in any position of the guage display. Simply keep pushing the button in it's corner until you have the meter you desire to be there. Now, back to the home page. From there I often choose trip. Once at the trip section of the guage, you can view 4 trip computers, each computer has about 12 screens. The main 4 trip computers are: CURRENT, TODAY, YESTERDAY, TANK. While at the current selection you can view 11 different screens about your current trip. OTHER OPTIONS: I was told while taking to Scan Guage on the phone, that the Scan Guage II can be set/programmed to display other meters than that 12 preset. The instructions are on their website and some in their instruction booklet. I'm going to program it to show actual horse power and display that on the guage page instead of the mph. This guage also can be programmed to send information to the ECU. I'm willing to bet that it can be set to clear service lights in models that need a computer to reset them like the S70's, etc. If I figure that out I'll be sure to post back. GLITCH: Urrrrrrrrrrgggggggggggg! I do have one problem. When connected to my 960, the MPG meter doesn't work right. When you first hook up the guage you are suppose to do a master reset. Then you go to the gas station and fill up. Then you drive around until you have less than 1/4 tank, drive to the same gas station, during the same time of day as before, then fill the tank up. Once you fill the tank back up you go to the fill up section and compare how many gallons you added vs what the computer think you added. If the number is off, you are suppose to use the arrows to calibrate the actual gallons added and record the FACTOR %. Once you do that you press done and the computer is suppose to know your miles/gallons to empty from then on. Well, that works great on my '95 850 T-5R, but not on my '97 960. After I do that, every time, it looses the ability to know my MPG. It will range from 256 MPG and go as high as 1250 MPG. I WISH!!! Scan Guage has not been able to help me figure the problem out so I'm going to try different things to work it out. I think I'm going to NOT calibrate it after the next RESET and see what it figures out on it's own after 3 or 4 tanks of gas. I have tried the manual method about 5 or 6 times over the past 12 months, it's just not working right with the 960. OTHER USES: Since I drive around with the thing in my car, I am able to help others that I see on the side of the road. I have helped several people get their codes and let them know what was wrong with their cars while they were broke down. I also used it to drive a car home that had a broken water pump. I hooked up the guage, set the temp on the screen, and used driving methods to keep the temp in a safe range without overheating the car, VERY COOL. OVER ALL: If you don't have a scan tool, get the scan guage. It's well worth the price and will pay for itself in no time. i know a way to get 35 mpg interested ? Wooooppppssss, it's back to crazy. I got gas the day before yesterday and did not fill up so I skipped the fill up screen. Yesterday I drove about 50 miles and it read that I was getting 583 mpg. Today so far it is reading that I'm getting 134 mpg. So I'm guessing that I'm back to crazy readings with the 960 until I fill up and do the fill up screen. hookuspookus, if you know how to get 35 mpg with a 960 I'm all ears (eyes). Where did you mount it and what's the actual size of the scanner? Looking at the IPD catalog, it looks like it might be 1 DIN and would fit in the radio hole - I replaced my factory unit with a 1 DIN radio and a 1 DIN pocket. I'd love to mount this little bugger under the radio if it'll fit/look slick. Any suggestions? I set it in front of my tack. I blocks some of my warning lights down there but that's ok with me. It fits perfectly in the slot next to my lighter. I pulled that little tray out, cut a slot in it for the wire, ran the wire under the panels so you can't see them and in the back of the slot above the ash tray and it fits there like a champ. It's pretty low so I don't really like it there. Also, I pulled the gauge, hooked it up in the 850 for a week or so, then moved it back to the 960. Ran through the set-up and it works good again. However, if I try to go through the refuel screen after the initial set up it goes crazy on the mileage again. So I don't do the refuel screen. Therefore I may never know exactly how many miles to empty I am but other than that it's great. As for the miles to empty... I use to drive about 450 miles on a tank of gas, now I can get about 553 miles per tank. I actually drove from Albuquerque to OKC on one tank of gas. Thanks to the gauge I was able to find the sweet spot in the car and was getting as much as 33 mpg at times. Yes!!! Someone needs to get one of these and let us know how they like it. It is suppose to let you know your evap pressure, boost pressure, etc. A heck of a lot of info to gleen from. Well, I have decided to pin this item because so many people ask about OBD-II scanners and ScanGauge II has stepped up their game. One thing that I did not realize that it does it let you know if your car is ready to pass the emissions test given by some states like CA or MA. If you hit the scan button, the next screen will tell you if it's ready to pass emissions test or not. Didn't know it was able to do that because we don't have inspections here in Arkansas. Also, they have added some performance gauges that keeps track of actual track times. That's a winner to me. Awsome. @ CJaneczko: Yes it is 1 din high. When I got my wagon it had an after market 1 din radio installed and a slot under it. My ScanGauge II fit perfectly in that slot under the radio. This thing can also send signals to the ECU. I know there is a code or preceedure to set it up to reset the service reminder light in the '98 S70's but I would have to start trying different things to figure it out. I just got one of these and have seen mention on some forums that you can get air intake temp from the MAF. Anybody know how to do this for a 95 turbo wagon? You can only get that if the ECU monitors it. I don't think the 850's did. Nor did they monitor turbo boost pressure. Anyone figure out how to use the Scan Gauge II to clear the Service-Engine light on a 98' 70 series Volvo yet? My light came on yesterday and I'd rather not take my C70 into the shop or buy a DRAPER tool simply to clear a service reminder light! I miss my 94 850 Turbo... much easier method on essentially the same car. No such luck with Scan Gauge II?? Well DRAPER tool it is unless I can convince the shop to do it without charge.. I will be pulling the bulb when I need to remove my dash. Just spent the entire summer working beneath the dash on my rangie heater core faults.. DONE with interior repairs for a while.. Some people use some scan tool software with a laptop to reset it. The dash removal is pretty easy on these cars. I've been reading up online re the 'Ultragauge' with the view to getting one to hook up in my 2002 V40 but haven't yet been brave enough to click the Buy Now button. Want it mainly for the Kilometres / Litre display and the overall fuel economy features but looks to be a very versatile tool overall and cheaper than the 'Scangauge' at $69 US + shipping of course. I have read that they are good but have a bit of a learning curve. You will likely save the cost in less than 6 month in gas savings. The size of the Ultragauge is appealing too. About the size of a standard creditcard and several mounting options. I thought centrally on top face of the steering column (V40) and forward of the main instrument cluster. Minor obscurement of warning lights but less with the steering tilted down a little more. Volvo Chemical Gasket - to use or not to use? So after 3 months with the car, this is list of replacement parts! HU-650 Seek and Scan Issue?